Registration is now open for the 10 Days Summit. We hope you'll be able to join us in San Antonio this April 9-12. What is the 10 Days Summit? The 10 Days Summit is an annual gathering focused on the strategy and themes of 10 Days. Featuring transformative teaching and vision casting from leaders around the world in an atmosphere of worship and fellowship, you will not only learn about movements of John 17 unity but also taste and experience what you're learning about! Since 2016, these Summits have been key to connecting hearts, deepening our understanding of God's purposes, and launching movements. They have led to the launching of 24/7 prayer canopies in the 1 Church/1 Day model and to numerous 10 Days expressions as well. If you are wanting to launch 10 Days in your city, connect with like-hearted John-17 movement leaders, or take your city-team deeper, the Summit is the best opportunity for that. Dates: Tuesday, April 9 (noon) to Friday, April 12 (noon). Main Venue: San Antonio Tabernacle House of Prayer @ City Church International (8800 Broadway St. #225 San Antonio, Texas 78217). Lodging: We'll be staying at the Courtyard Marriott in San Antonio (8615 Broadway St. San Antonio, TX) which is right next to the airport and walking distance from our main venue. We have a room block reserved--Call 210-828-7200 prior to March 19 and reserve a room as part of the "10 Days Summit" to receive the discounted rate. The Room cost is $99/night and each room has two beds. Breakfast is included. The nights are April 9, 10, and 11. Transportation: No Car Needed! The hotel has a shuttle to and from the airport, and our main venue, along with many restaurants, are a short walk from the hotel. We will provide transportation for any "field trips" in the San Antonio area. Food: Meals are available at nearby restaurants. We hope to see you in San Antonio this April! Last year’s Restore and Revive gathering surprised and delighted all those who attended, exceeding our wildest dreams. Seeing the Moody Auditorium filled nearly to capacity with passionate worshipers was absolutely incredible, and that wasn’t even the best part. As many described it, Restore and Revive was a taste of Heaven on earth. In the 1880’s and 90’s, Moody’s contemporaries described Northfield as “Heaven on Earth”. The fact that that is once again being said again after all these years is nothing short of a miracle and is a sign of what God is doing in New England. 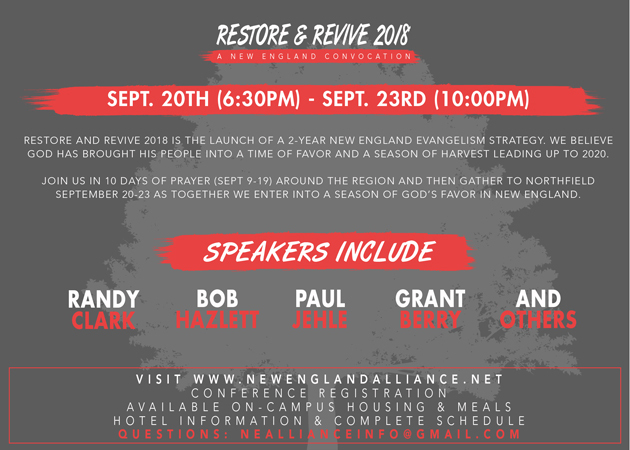 We are beginning to see a significant move of God to both Restore and Revive the church of New England before our eyes! This year, 10 Days and Restore and Revive will serve as the kick-off for a regional two- year focus on evangelism. 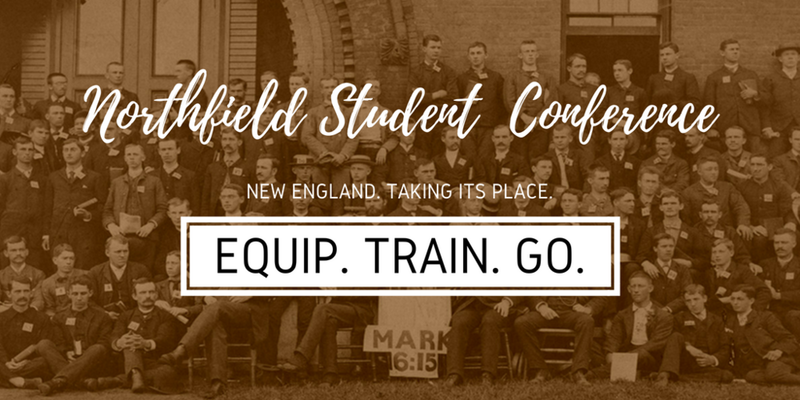 We believe that God is inviting New England to enter into a time of His favor and a season of harvest leading up to 2020 and the 400th anniversary celebration of the Pilgrim’s landing. Registration Details: Until July 16, we are offering “all-inclusive” packages that include food, on-campus housing, and any registration fees for 10 Days Northfield (which includes R&R) and Restore and Revive. We’ve priced them both to be great deals and as affordable as possible! For on-campus housing, this is the best deal and best opportunity to secure housing on-campus. We will also be offering the all-conference registration fee (no food/no housing) during this period. Full Registration will open July 16, including day-registration fees, individual meals, and any remaining housing on a day-by-day basis. Registration and the most current information on hotels, schedule and speakers is all available at Newenglandalliance.net. The new and improved website will be up by August 1st! Group pricing is available for groups of 10 or more: contact Janea at neallianceinfo@gmail.com for group rates, scholarship applications, and questions on registration. Cost: $250/student or $200/student if registering as a group of 3 or more. VISIT HERE to register and for more information. The 10 Days Summit is an annual gathering focused on the strategy and themes of both the 10 Days and 1 Church/1 Dayprayer strategies. Featuring transformative teaching and vision casting from leaders around the world in an atmosphere of worship and fellowship, you will not only learn about movements of John 17 unity but also taste and experience what you're learning about!